27 Items. Showing Items 1 thru 9. Autumn's Arrival - Crisp days, falling leaves, glorious colors and an assortment of pumpkins. Who could ask for more? 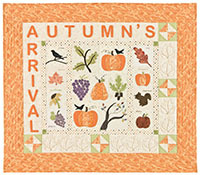 This 41" x 36" wallhanging offers a glimpse into the wonderous days of autumn. Mr. Pumpkin Head is peeking out from behind his holiday tree. Is it Trick or Treat time? 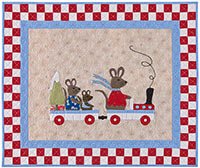 This cute 24" x 21" wallhanging will make you smile your way through Halloween. The quilt can be made with or without the wooden candy corn buttons. The wooden buttons are handpainted in the US and are sold separately. The arrival of crisp autumn days reminds us that Halloween and Trick or Treat time are fast approaching. 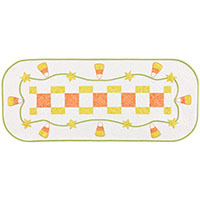 And if you love candy corn, then you will be delighted with this festive 17" x 40" table runner. 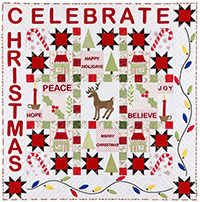 You can create a family heirloom with this festive holiday pattern. 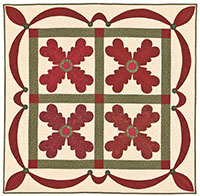 Pieced blocks intersperced with applique blocks and embroidery make it a joy to behold! The finished quilt is 50" x 50". Wouldn't the world be a wonderful place if we kept Christmas In Our Hearts Year Round? To have treasured moments with family and friends, to see the joy in children's faces, and the warmth you feel inside, whether you are young or old, when Christmas draws near. 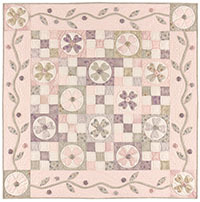 This beautiful 40" x 40" quilt can be used all year round to keep joyous memories close at hand. Gentle Violet, a 42" x 42" quilt, brings peace and harmony into our hectic lives, conveying tranquility, just like a day at the spa. The sheep are in the meadow and they are saying "Good Morning" to the rising sun. What a wonderful start to a beautiful day. 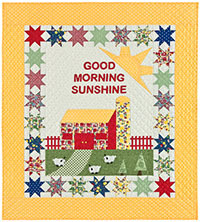 Creating this 36" x 40" quilt is like bringing a breath of sunshine into your sewing room.